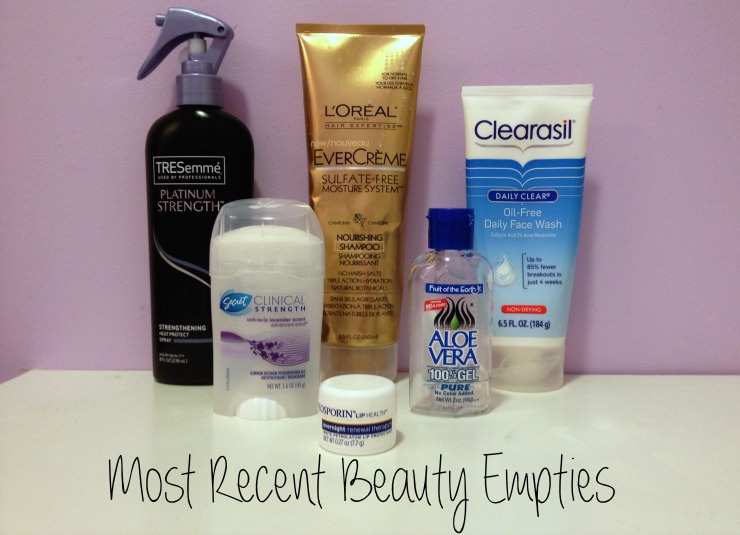 I always love when everyone shares their monthly empties, but my empties don't usually time up where I have enough for each month. However, for once they have & lately a lot of things I use have run out on me. Here's what I had to pick up most recently at the store & how I feel about them. I've been using this heat protection spray for a while & there's a reason why: it works wonders. I spray my hair before I blow dry it, & then again before I flat iron (or curl) it. It might sound crazy, but when my hair is dry & I spray it on I can feel a protective barrier when I touch my hair. Using this has definitely improved the health of my hair, which is why I continue to use it. This is something that I recommend that anyone who styles their hair with heat picks up. I use this on days when I don't use a baking soda mixture (aka when I'm too lazy to mix it). I went with this because it is sulfate free, & I am trying to get away from using sulfates. Since I've started using a combo of this & baking soda to wash my hair my scalp no longer incessantly itches, & my hair feels softer & healthier. They sell this in the school convenience store & I first picked it up last year on a whim because I was running out of face wash (& I could use meal points to buy it). I liked it for my face, but a few months back landed up switching to Proactiv. Then the skin on my chest started to really break out so I decided to use this to wash my chest in the shower. It has really helped to clear it up, & I've actually repurchased it a couple times. It's a little too drying on my face for daily use, but works wonders on the super oily skin on my chest. So I've always had kind of a gross sweating problem & once this came out I jumped on it because I was close to needing actual prescription deodorant. Ever since I started using this I've never looked back, it has helped to control my sweating & always keeps me fresh. I put it on before bed & then again in the morning & am good to go for the entire day. Regular face moisturizer was contributing to the breakouts on my chest, but I needed to find something to keep it from getting too dry. I was trolling through Pinterest one day, & read somewhere that aloe vera gel helps acne, & I knew that aloe had moisturizing properties so I decided to use aloe in place of face moisturizer. Using this has kept my skin moisturized & has really helped to clear up the skin on my chest. Needless to say I have already picked up a bigger bottle then this little sample size. I talked about how much I love this here. My lips are crazy dry & if I do not use this every night (no matter how much lip balm I put on during the day) my lips will crack & bleed nonstop. Also when I use this I don't have to put on lip balm 5,000 times a day, which is great because I always forget to do it! As I'm sure you can tell I would definitely recommend purchasing all of these products, as they have worked really well for me. Soon I am going to do a post about clearing up chest acne because I have put together a great routine that has been working really well! So tell me have you used any or these products or something similar? If you have used them what did you think of them? Today I am linking up with Because Shanna Said So. On a completely separate note I wanted to share with you guys again one of my sponsor's from this month Anna from Anna Czarina. Anna's great blog features topics from fashion to baking (no wonder I love it so much!). 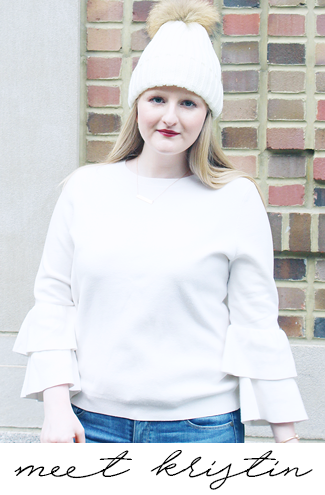 To get a taste of her blog here are Anna's 5 favorite posts: Nailspiration | Marc Jacobs Stripey Lips Sugar Crystal Butterfly Banana Cake Pink Blush & Giveaways Wonderstruck by Taylor Swift The Charm Life Make sure to stop on by & give her some love! You do the baking soda treatment too? I started doing that back in 2010 and quit maybe 8 months ago. I keep meaning to switch back as my hair definitely looked better and less limp in those days! I think I might stop by the store tonight in fact! I love the Clearasil wash. I've been using it for years. The heat protect spray is great too. I need to try that hear protectant, I'm looking for a new one! Ha -- I love the idea of sharing the products you use when you're all finished with them instead of when you get them. Makes for a better review! Aloe cleans up breakouts!? Who knew! Thanks for that tip *runs to the store to purchase largest bottle of aloe*.